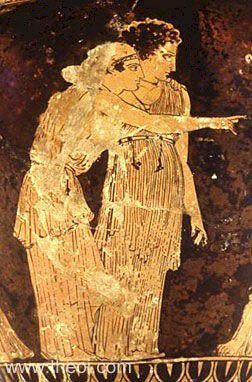 Detail of Nemesis (Indignation) and Tyche (Fortune) from a painting depicting the seduction of Helen. Nemesis points a dissaproving finger at Helen as Aphrodite persuades her to elope with Paris. Tyche, presumably in her role as the dispensor of ill-fortune, is directed to witness the scene by her indignant sister.